Israeli ambassador says he expects 'dramatic change' in Iran deal, expresses appreciation for US support for Israel. Ron Dermer, Israel’s ambassador to Washington, told a Rosh Hashana (Jewish New Year) event packed with US officials that Israel would enforce two red lines in the civil war in neighboring Syria: The transfer of major weapons to Hezbollah and the establishment of a permanent Iranian beach head in the country. “Israeli Prime Minister Binyamin Netanyahu has been very clear about Israeli red lines in Syria, and Israel has acted to enforce those red lines,” Dermer said Tuesday evening at a Rosh Hashana party at his residence in suburban Washington D.C. These red lines, he explained, are “the transfer of game-changing weapons to Hezbollah and the opening of a front” for anti-Israel terrorism. The Netanyahu government has been wary of what the end-game could be of US efforts to end the war in Syria. There’s a concern among Israelis — articulated most often by the defense minister, Avigdor Liberman (Yisrael Beytenu) — that the Trump administration might defer to Russia, which is allied with the Assad regime. Russia’s Assad alliance means it is in a de facto alliance with Iran and its Lebanese ally, Hezbollah, because they too are allied with the Assad regime. Combat planes last week attacked what is believed to be a chemical weapons facility in an Assad-held portion of western Syria. Syria blamed Israel. Israel has not acknowledged responsibility. Dermer cast the intensification of Iranian influence in Syria as a consequence of Obama administration policies, particularly the 2015 Iran nuclear deal, which traded sanctions relief for rollbacks in Iran’s nuclear program. He said Iran hit the “double jackpot” with the deal, earning money while not truly giving up its nuclear ambitions, and has since used it to expand its influence. Outside of concerns over the possible outcomes of the Syria civil war, Netanyahu and Dermer have made no secret of their preference for US President Donald Trump over former President Barack Obama. Dermer twice said he was “deeply grateful” to the Trump administration, for its role in brokering closer ties between Israel and Sunni Arab nations — a closeness spurred in part by shared concerns about Iran and Islamist terrorists — and for US Ambassador to the United Nations Nikki Haley’s “unequivocal support.” He called for applause for US Middle East Envoy Jason Greenblatt, who was present at the event. Dermer expressed support for congressional legislation that would slash US funding for the Palestinian Authority as long as it continued payments to the families of terrorists. In expressing support for Greenblatt’s peace brokering efforts, Dermer notably did not note that the centerpiece of the Trump administration’s peace push is restarting face-to-face talks between the Israeli government and PA Chairman Mahmoud Abbas. 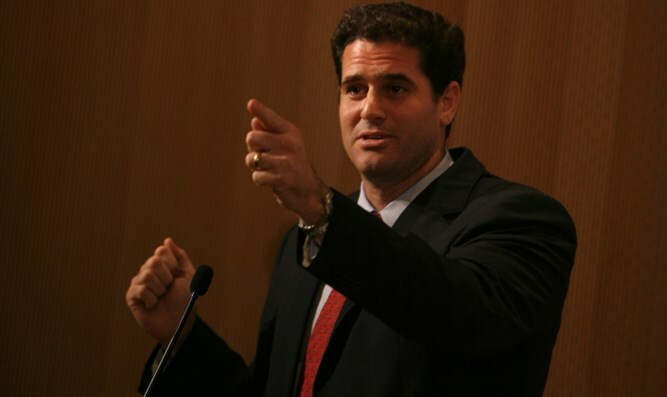 Dermer said he anticipated a “dramatic change” in the US position on the Iran nuclear deal in coming weeks, saying that there would either be changes to the deal, or it would be scrapped. Trump has said he might not reapprove Iranian compliance with the deal when he is next due to do so, next month.